A commodity is a product or service that is sold by multiple sources without any quality distinction. For example, gold is a commodity because wherever it may be mined and by what company, it's essentially the same product. Competitively selling a commodity is exceptionally tough because, without some extra benefit to differentiate the product from its competitors, the salesperson can't give a meaningful reason—aside from low price—why the prospect should buy from him and not someone else. Fortunately, few products are truly commodities. A creative approach can find points of difference between just about any product or service. Water is a good example of a commodity transformed into a differentiated product. For a long time, no one cared where their water came from as long as it wasn't poisonous or bad-tasting. Then came the invention of 'pure' bottled water with its avalanche of health and environmental claims. Water companies told prospects that their water was superior because it came from a secret source high in the mountains, because it was super-filtered and purified, or because it was full of special vitamins. 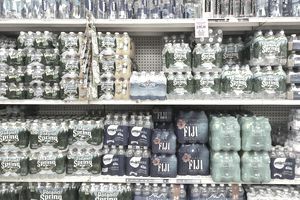 Today every supermarket boasts shelves and shelves of bottled water from dozens of companies. If these companies can create and maintain a competitive market for water, imagine what you can do for your product with a bit of creative selling! Salespeople have three basic options for differentiating products: quality, service or price. Most companies will choose to focus on one or two of the three product aspects, as it's impossible to provide all three and stay solvent. Emphasizing quality and service means spending more money on parts and employees, making it impossible to beat your competitors' prices. Unless you are in a position to dictate company policy, your options will be somewhat restricted by the company's decision as to which areas to emphasize. However, most salespeople will find that they do have some leeway. For example, your ​sales manager may allow you to offer an extended warranty to a promising prospect, which allows you to differentiate on either service or quality (depending on how you pitch it). Price differentiation is usually the least desirable option for a salesperson because you will end up paying for—in the short term, with a smaller commission check; in the long term, because customers will come to expect those lower prices in the future. Offering a discount should be a last resort if quality and service differentiation fails. You can differentiate on quality by pointing out features of your product that are missing from its competitors. A little company research may uncover other plusses, such as extra quality assurance during the manufacturing process or an above-average reliability record. Other quality options include a free trial before purchase (which gives the prospect a chance to see how exceptional your product is) or a warranty period after purchase. Service differentiation often has to do with how the prospect is treated after purchase. Giving your prospect the royal treatment during the sales cycle will reassure him that your company will continue in the same vein after he buys. Customer testimonials can also help. And cultivating allies among your coworkers from other departments can be extremely helpful. A friend in the shipping department who can arrange for quick, hassle-free delivery or a tech support rep who will do you a favor by providing extra help with setup will go far to differentiate your company's service in your prospect's eyes.